Timm Wenger, owner of Tuktuk Lancaster, drives his three-wheeled electric auto rickshaw on a sightseeing tour in Lancaster. The company is appealing the Public Utility Commission’s decision in July to deny it a license. The Pennsylvania Public Utility Commission voted Thursday to reconsider its denial of a license to a Lancaster company offering sightseeing tours in a three-wheeled electric rickshaw after the city's mayor and other officials threw their support behind the project. 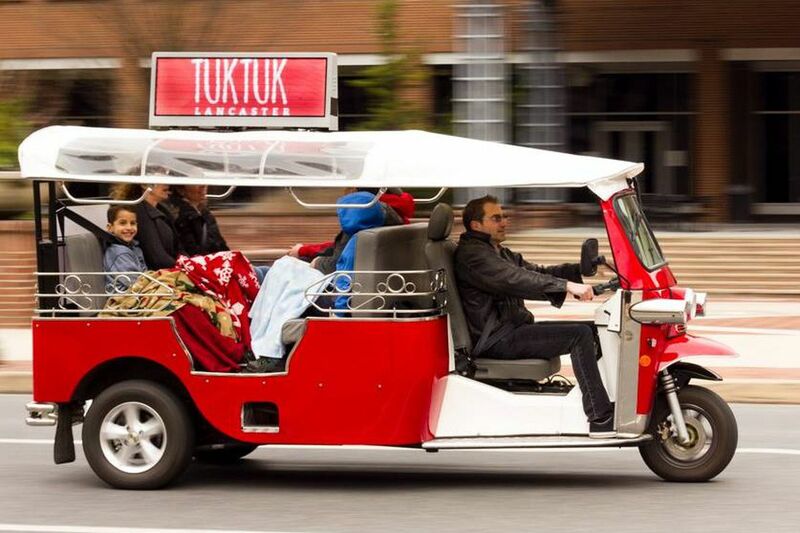 The PUC voted to rethink its 3-2 vote on July 12 to deny a license to Tuktuk Lancaster, in which it cited safety concerns about the open six-person vehicle. The company, in requesting a reconsideration, included additional safety information provided by the vehicle's Denver manufacturer, e-Tuk USA. The company's filing also included a letter of support signed by Lancaster Mayor J. Richard Gray, Police Chief Keith R. Sadler, and Public Works Director Charlotte Katzenmoyer, who said the electric carts would not impede traffic because they travel at 25 miles per hour, the speed limit on all city streets. "The city of Lancaster does not have any safety concerns regarding Tuktuk vehicles operating on city streets alongside heavier vehicles," the officials said. In a separate filing, the company also asked the PUC to decide whether the state agency even had the authority to require Tuktuk to get a license as a common carrier, saying the company's transportation service is incidental to its primary business, sightseeing. Tuktuk's lawyer, Karen O. Moury of the Eckert Seamans law firm, argued that the company's business was similar to horse-drawn carriages and other sightseeing vehicles that the PUC no longer regulates because their transportation service is secondary. Tuktuk cited a landmark 1990 Commonwealth Court decision involving the Society Hill Carriage Co., which affirmed the PUC's deregulation of horse-drawn carriages. The PUC later extended the decision to trackless trolley in Hershey that was fashioned to look like a streetcar, and a ferry in Millersburg whose primary business was tourism. The vote to reconsider is the latest legal twist in Tuktuk's saga. It initially applied in December for a paratransit license, and had been operating for free and asking clients to make a donation to a charity. It suspended operations on July 23 after the PUC's license denial, saying it did not have the money to pay a lawyer to appeal. But the firm raised funds from supporters through an online crowdsourcing campaign, and hired Moury, a seasoned lawyer who appears frequently before the commission and who worked as a PUC staff attorney on the original cases dealing with horse-drawn carriages. The PUC can take up the reconsideration issue at any time. "We hope they will act soon and we can still salvage some of the tourist season," Timm Wenger, who owns the company with his wife, Kristina, said in a telephone interview Thursday.